FBI photos show Brandon Baxter, top from left, Anthony Hayne, Connor Stevens; bottom, Joshua Stafford and Douglas Wright. One of the most talked-about stories on Tuesday was about five men arrested for allegedly conspiring to blow up a bridge about 15 miles south of Cleveland, according to court documents released Tuesday. Authorities say at least three of the men are self-proclaimed anarchists, and a lot of readers pondered what kinds of philosophies the men held and how they could be classified politically. Readers speculated about the political backgrounds of the men. Several readers suspected they might identify with the Occupy movement, but some had other ideas. BobRoss: "I love how some of these leftists try to deny reality (aka lie) by saying that anarchists are from the 'far right.' All of the major anarchist movements have been led by leftists and have been closely aligned with Marxism. By the statements for these guys it is clear that they are not in any way libertarians or 'right wing,' but sincere anarchists. I can understand though. I would try to deny their affiliation if I was you also. My guess is the Occupy Wall Street crowd is going to enter into a full PR campaign to distance themselves from these guys." djfl00d: "Two flaws with your argument: Anarchists are anti-government. This is hardly a far left ideology, rather is closer to a far right ideology, yet is still inaccurate because if anarchists are anti-government, they are anti-political. Secondly, you have to think of politics as a circular scale, not a linear one. If you lean too far to either the right or the left, you begin to incorporate ideology from the other side." Samilcar: "I'm certain these guys aren't connected to any Occupy groups. They all look like those violent tea partiers." 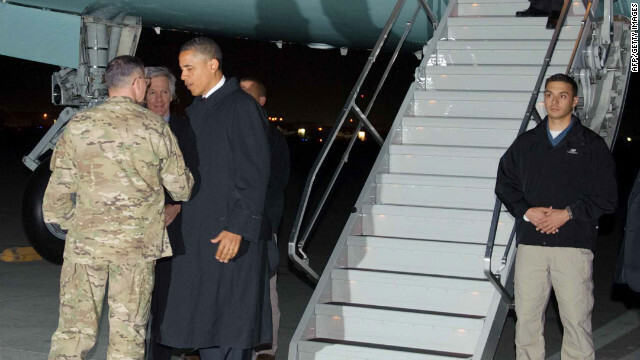 President Barack Obama is greeted at Bagram Air Base, Afghanistan, shortly after landing at about 10:20 p.m. local time Tuesday. [Update, 7:43 p.m. ET] U.S. President Barack Obama, speaking at Bagram Air Base in Afghanistan, said in a U.S.-televised address that "the goal that I set to defeat al Qaeda and deny it the chance to rebuild is now within our reach." By the end of 2014, Afghans will be fully responsible for the security of their country, he said. "I will not keep Americans in harm's way a single day longer than is required for our security, but we must finish the job we started in Afghanistan and end this war responsibly," Obama said. Obama's remarks came during a previously unannounced visit to Afghanistan. He arrived late Tuesday night. During the visit, Obama and Afghanistan President Hamid Karzai signed a Strategic Partnership Agreement that outlines cooperation between their countries after the withdrawal of U.S.-led international forces in 2014. [Update, 4:07 p.m. ET] U.S. President Barack Obama and Afghanistan President Hamid Karzai on Tuesday signed a Strategic Partnership Agreement that outlines cooperation between their countries after the withdrawal of U.S.-led international forces in 2014. [Update, 3:17 p.m. ET] U.S. President Barack Obama made a previously unannounced visit to Afghanistan on Tuesday, the first anniversary of the U.S. raid that killed Osama bin Laden in neighboring Pakistan. On his third trip to Afghanistan since taking office, Obama will meet with Afghanistan President Hamid Karzai and make a televised address from Afghanistan at 7:30 p.m. ET. Tuesday's visit comes at a particularly delicate time in relations between the United States and Afghanistan. The countries have been negotiating a strategic agreement that would outline the basis for U.S.-Afghan cooperation after most U.S. and allied troops withdraw in 2014. Obama and Karzai are expected to sign the agreement on Tuesday. More than 130,000 troops from 50 countries serve in Afghanistan, according to the NATO-led International Security and Assistance Force. The United States is the biggest contributor, providing around 90,000 troops, followed by the United Kingdom (9,500), Germany (4,800) and France (3,600). CNN profiled several women who refuse to retire to mumus and drab outfits, instead choosing clothing that would make a bold sartorial statement at any age. The styles these older women are adopting, highlighted in blogs like Advanced Style and Idiosyncratic fashionistas, typify a desire to tailor fashion toward personal interests versus trends. Readers talked about their own fashion ideals. This reader wishes she could wear hats at work. dragonwife: "I have to go with the old saying: I may grow older, but I'll never grow up! Wear what you like, as long as it's appropriate for the situation (for example, a suit and heels probably would be a bit much for doing yard work), and if they don't like it, too bad. If they allowed me to wear hats at work, I'd be wearing one frequently; as it is, I like to wear them when my husband and I go out. And wear what looks good on you and makes you happy, not what some designer or magazine says is the latest trend. A wonderful quote from Edna Woolman Chase - 'Fashion can be bought. Style one must possess.' I'll stick with style - my own (says the 57-year-old who takes martial arts classes and sings karaoke)!" Today's Mash-up seems to have taken on a theme of attaching meaning and purpose to life. You always wonder about your short time here on Earth. We come and then we go. Sometimes we spend 110 years on Earth and not really accomplish much. Sometimes we go in our 20s and make a huge impact. Here Avery spends 6 months with us and does more than most people in their "full" lives. That's the real bucket list, the list of things she accomplished for total strangers. Avery Lynn Canahuati died Monday, her father said. 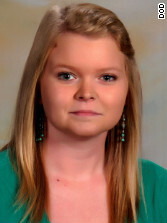 This brings our attention to another sick child who had an impact on others. CNN affiliate WLFI reports that 12-year-old Cody Green of Flora, Indiana, had always admired the strength and courage of the U.S. Marines. After fighting off leukemia three times, Cody died Saturday. Members of the Marines "decided Cody, with the strength and honor and courage he showed through the whole thing, he should be a Marine," Cody's father, David Snowberger, told the station. Cody was given Marine navigator wings and was made an honorary member of the United States Marine Corps. One Marine did more; follow the link to find out. As a military child who has an autism spectrum disorder, this is inspiring. For so long as a teenager, I blamed others for all my faults. Yes, I have had some rotten luck in the past. Yes, I've been screwed over by other people. Ultimately though I can't control that. I can only control myself. My failures are mine and mine alone. I've been realizing lately how lazy and disconnected from reality I've been and that I've got no one to blame but myself for my current predicaments in life. No more. It's time I take matters into my own hands. If these people can do it, why can't I? Photojournalist and CNN iReporter Syed Yasir Kazmi, an aspiring Sufi, or Islamic mystic, shared photos of Sufis in prayer in Karachi, Pakistan, at the tomb of Misri Shah. "Most people are confused about lots of things in different religions and faith," he said. "Sufism, Tassawuf, gives you the power to find a proper direction to find yourself and God. Sufism is a branch of religion, but religion is not a part of Sufism. Anyone can join the system." Michael Twitty literally has a taste for discovering the meaning of his life. He's going all Alex Haley to figure it out as he seeks to trace his ancestry - which includes slaves in the American South - through food. Slavery is not just a practice or moment in American history; it is a metaphor for our relationships to lifestyles and food systems that many of us view as beyond our control. Most of us are enslaved to food systems that aren't sustainable, but eat we must. And because we must eat, food is a natural vehicle for telling the kinds of stories about historical slavery and the impact of "race" on how we eat, even as we critique and question our contemporary food politics. Food is our vehicle to move beyond race and into relationships and use those relationships to promote the kind of racial reconciliation and healing, our nation desperately needs. Sometimes one needs a little help rising above one's circumstances. Tomorrow's Aeronautical Museum in Compton, California, is trying to do just that by teaching hundreds of city kids how to fly. These junior pilots - some as young as 5 - learn about aerodynamics, math, physics and other sciences along the way. This program, it's bigger than me; it's bigger than my family. Something really phenomenal is about to happen here. We're working on a program now to make some of these kids astronauts. If I have to live out of a cardboard box, then so be it. Not unlike a retiring baseball player, Newt Gingrich will need to start thinking of himself as something other than a presidential candidate after Wednesday. Gingrich will end his bid for the Republican nomination, a source close to the former House speaker told CNN. 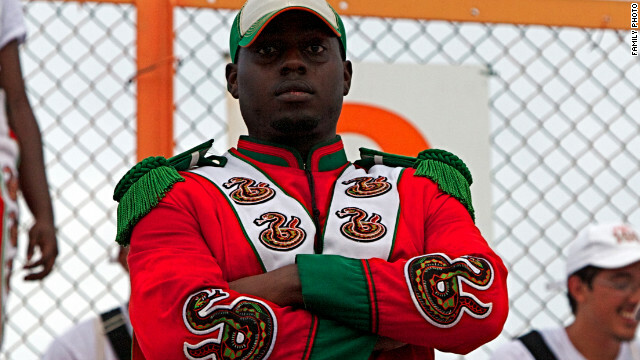 Florida A&M University student and band drum major Robert Champion, 26, died November 19. Criminal charges are expected to be filed Wednesday in Orlando, Florida, in the suspected hazing death of Florida A&M University drum major Robert Champion, a law enforcement source close to the investigation told CNN. Some FAMU band members have said Champion died last November after taking part in an annual rite of passage called "Crossing Bus C."
The crossing the bus ritual is an initiation process in which pledges attempt to run down the center aisle from the front door of the bus to the back while being punched, kicked and assaulted by senior members, band members have said. Champion collapsed in Orlando on the bus, which was carrying members of FAMU's Marching 100 after a November football game that included a halftime performance by the group. 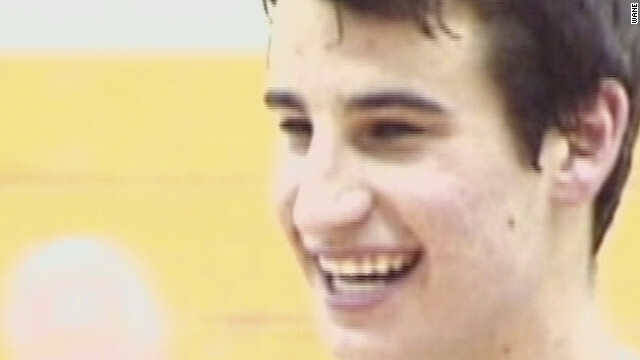 The medical examiner's office ruled his death a homicide and said Champion "collapsed and died within an hour of a hazing incident during which he suffered multiple blunt trauma blows to his body." An autopsy found "extensive contusions of his chest, arms, shoulder and back," as well as "evidence of crushing of areas of subcutaneous fat," which is the fatty tissue directly under the skin. The death prompted the FAMU board of trustees to approve a new three-part anti-hazing plan, which includes an independent panel of experts to investigate. Prosecutors say Adis Medunjanin was trained by al Qaeda and that he planned to bomb the New York subway system. A Bosnian immigrant accused of plotting to bomb New York City's subway system as an "al Qaeda terrorist" has been found guilty on all counts. Adis Medunjanin was charged with conspiring to use weapons of mass destruction and conspiring to provide material support to al Qaeda. He faces life in prison. In closing arguments late last week at a federal court in Brooklyn, Assistant U.S. Attorney Berit Berger said that Medunjanin was willing "to strap a suicide bomb to himself, walk into a New York City subway and blow it up." 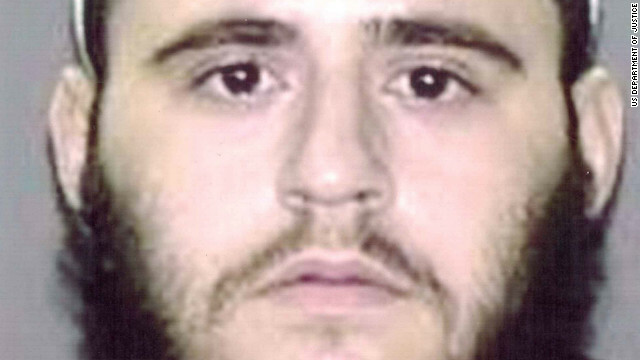 Prosecutors had argued that Medunjanin traveled to Pakistan's tribal belt with two friends, Najibullah Zazi and Zarein Ahmedzay, where he sought to join the Taliban but ended up being recruited by al Qaeda to perform a suicide mission back in America. Upon their return to the United States, prosecutors contend that Medunjanin and his two friends hatched a plan to rig backpacks with explosives and blow them up. But Gottlieb denies his client had a role in such a bomb plot. Co-conspirators Zazi, an immigrant from Pakistan, and Ahmedzay, an immigrant from Afghanistan, have pleaded guilty to planning the attack with him and are awaiting sentencing. Both men have cooperated with the government and testified at Medunjanin's trial. Medunjanin's attorney, Robert Gottlieb, denied those accounts, insisting his client traveled to Pakistan "not to join al Qaeda, but to join the Taliban in fighting foreign troops in Afghanistan." 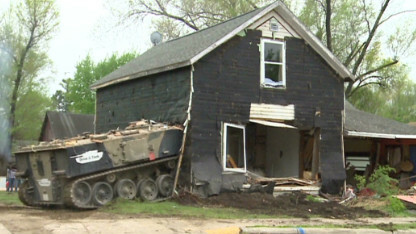 A tank drives through a house that is set to be demolished. Ask any little kid. The most fun part of building something is knocking it down, right? 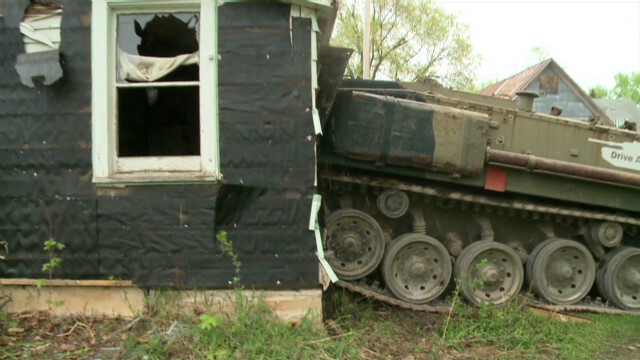 One couple found that out firsthand when they demolished their own house.... with a tank. You've Gotta Watch these awesome demolitions. Owners of this 150-year-old home decided to have some fun and tear it down with a tank. Watch the video to see it all come down. Plus, find out how the average person can get his hands on a tank! This 150-year-old home was set for demolition, so the homeowners decided to rent a tank to tear down their house. Watch the video to see the tank do its thing. Plus, find out where an average homeowner can get his hands on a tank! Whether it’s a bridge, a building, or a stadium, we get a guilty pleasure out of seeing a giant structure get blasted to bits. Check out an entire year’s worth of dynamite in this video. Whether it’s a bridge, a building, or a stadium, we get a guilty pleasure out of seeing a giant structure get blasted to bits. Check out an entire year’s worth of dynamite in this video. 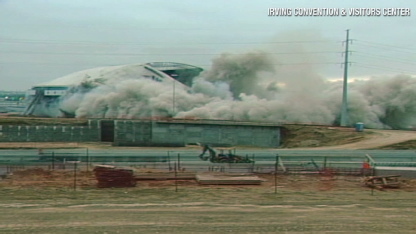 In 2010, Texas Stadium was destroyed in seconds to make way for a new home for the Dallas Cowboys. Beyond what it looks like, what it sounds like is amazing. 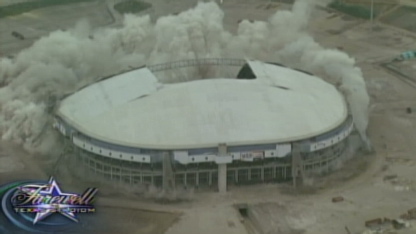 In 2010, Texas Stadium was destroyed in seconds to make way for a new home for the Dallas Cowboys. Beyond what it looks like, what it sounds like is amazing. 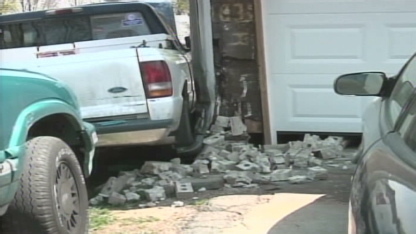 When an Ohio man found out that his home was going into foreclosure, he drove his truck straight into it. Watch the video to see why his plan didn't have a happy ending like the tank folks. This Ohio man may not have had a tank, but that didn’t stop him. When he found out that his home was going into foreclosure, he drove his truck straight into it. Watch the video to see why his plan didn't have a happy ending like the tank folks. A fourth congressional committee will look into the Secret Service prostitution scandal in Colombia, joining the acting inspector general of the Department of Homeland Security as well as internal reviews by the agency, the military and the White House. The top legislators on the Senate Homeland Security and Governmental Affairs Committee said Tuesday they sent a letter to Secret Service Director Mark Sullivan asking for information on the incident last month in Cartagena, Colombia, that has resulted in nine agents resigning or in the process of being forced out. =Three other Secret Service agents were cleared of serious misconduct, and the military is investigating the alleged involvement of 12 service members. 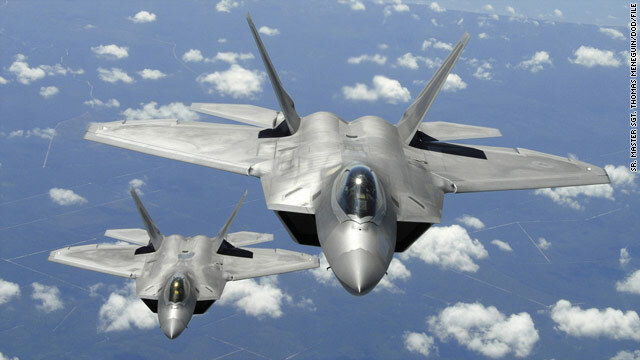 A few pilots have told the Air Force they won't fly their expensive F-22 Raptor stealth jets because no cause has been found for oxygen deprivation incidents in the cockpit, the head of Air Combat Command for the U.S. Air Force told reporters. The Air Force has been looking for the cause of about a dozen unexplained incidents related to hypoxia, or oxygen deficiency, with pilots, but so far has been unable to pinpoint it, Gen. Mike Hostage with Air Combat Command said in a media briefing. Hostage noted it was a very small group of pilots who opposed flying the Raptors. Pilots began experiencing problems starting four years ago. “For some reason, the on-board oxygen generating system and the environmental control system that feeds it may be inputting some contaminant,” Gen. Gregory Martin, a retired Air Force veteran, told CNN affiliate WAVY in Virginia. Hostage said if a contaminant is not the problem, there may be something else hindering pilots from getting enough oxygen. Hostage spoke at length with reporters about the issue, which has plagued the fleet since problems with the F-22’s oxygen supply system were first reported in 2008. The jets have previously been grounded to examine the issue , but one year ago the Raptors were again cleared and allowed to fly. In January 2011, the jets were limited to altitudes under 25,000 feet during an ongoing investigation into a November 2010 crash. Flying above that altitude could cause a pilot to black out from lack of oxygen and lose control. "We are diligently pursuing a variety of hypotheses to try and understand and characterize the exact circumstances we've been experiencing," he said. A New York judge Tuesday rejected claims by former International Monetary Fund chief Dominique Strauss-Kahn that a civil lawsuit against him should be dismissed because he was protected by diplomatic immunity. Bronx Supreme Court Justice Douglas McKeon denied a motion by Strauss-Kahn's lawyers to dismiss the lawsuit, which was filed by a hotel maid who accused him of sexual assault last year. A lawyer for the maid, Nafissatou Diallo, said his client was pleased with the decision. "We are extremely pleased with Judge McKeon's well-reasoned and articulate decision recognizing that Strauss-Kahn is not entitled to immunity," said attorney Douglas H. Wigdor. "We have said all along that Strauss-Kahn's desperate plea for immunity was a tactic designed to delay these proceedings and we now look forward to holding him accountable for the brutal sexual assault that he committed." Filed under: Crime • Dominique Strauss-Kahn • France • Justice • Lawsuit • New York • U.S. Global media tycoon Rupert Murdoch is "not a fit person" to run a major international company, British lawmakers investigating phone hacking at his tabloid News of the World reported Tuesday. The ruling could prompt British regulators to force him to sell his controlling stake in British Sky Broadcasting, a significant part of his media empire. The damning report accused Murdoch and his son James of showing "willful blindness" to phone hacking at News of the World, and said the newspaper "deliberately tried to thwart the police investigation" into the illegal activity. The paper's publisher, News Corp. subsidiary News International, "wished to buy silence in this affair and pay to make the problem go away," the Parliament's Culture, Media and Sport Committee found. 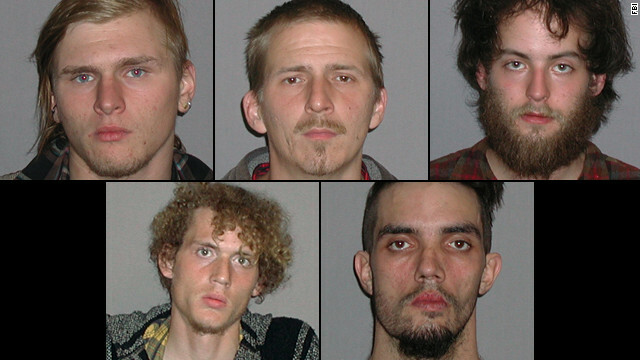 The FBI released these images of the defendants Tuesday morning. [Updated at 12:06 p.m. ET] Five men have been arrested on suspicion of trying to use what they thought were explosives to destroy a bridge near Cleveland, Ohio, the FBI said Tuesday morning. Some of the men on Monday planted what they thought were two remotely activated C-4-based explosive devices - which they allegedly bought from an undercover FBI employee - at the base of a Route 82 bridge that crosses from Brecksville to Sagamore Hills over the Cuyahoga Valley National Park, the FBI said in a news conference Tuesday. The devices actually were inoperable and posed no threat to the public, and the FBI arrested the men shortly after the devices were planted, authorities said. Douglas L. Wright, 26; Brandon L. Baxter, 20; and Anthony Hayne, 35, were arrested by the FBI's Joint Terrorism Task Force on Monday evening on charges of conspiracy and attempted use of explosive materials to damage physical property affecting interstate commerce, the FBI said. Also arrested were Connor C. Stevens, 20; and Joshua S. Stafford, 23. Their charges were pending. 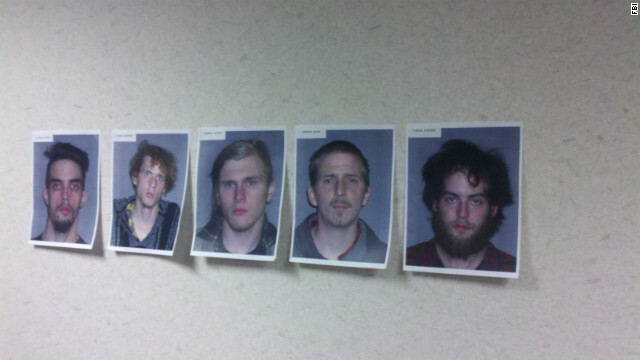 Three of the men are self-proclaimed anarchists, the FBI said in a news release. "The public was never in danger from explosive devices," the FBI said. The group initially planned to "topple financial institution signs atop high rise buildings in downtown Cleveland" while co-conspirators used smoke grenades to distract law enforcement, according to the FBI. But the plot evolved into plans for using explosive to destroy bridges or other targets, and the group finally decided on the Brecksville-Northfield High Level Bridge, which carries Route 82 over the national park, the FBI said. Some of the defendants, after they planted the devices, intended to detonate them from a remote location that they believed was safe and could provide them with an alibi, authorities said at Tuesday's news conference. The FBI learned of the plots through a confidential source who met Wright at a Cleveland-area protest event in November, according to a criminal complaint filed in U.S. district court. Wright told the source that Wright and a group of anarchists "had been discussing plans involving violence and destruction to physical property ... to send a message to corporations and the United States government," the complaint reads. Far-right presidential candidate Marine Le Pen said Tuesday she is not endorsing either President Nicolas Sarkozy or frontrunning challenger Francois Hollande, both of whom are courting far-right voters by emphasizing immigration ahead of Sunday's runoff election. "Sunday I will vote blank," Le Pen told supporters, "and in June (legislative elections) I will vote marine blue," a play on her name and the color of her party, the National Front. In the first round of voting April 22, Hollande received 28.6% of the vote, slightly ahead of Sarkozy's 27.2%. Le Pen received 18% of the vote - enough to prompt both candidates to reach out to the National Front's 6.5 million voters. 12:00 pm ET - John King live chat - CNN's John King is back for his weekly chat on CNN.com Live! Don't be surprised if he talks about the anniversary of Osama bin Laden's death, and how the candidates are reacting to it. Send your questions to John via Twitter @JohnKingCNN and he may answer them live. A helicopter carrying members of the Colombian Air Force and police crashed in the north of the Latin American nation on Monday, killing all 13 people on board. The crash took place at 4:30 p.m. local time (5:30 p.m. ET) in the municipality of Sabanagrande, near Colombia's Caribbean coast, according to a statement from the Colombian Air Force. Seven of the dead were from the air force and six were from the police. "We regret the accident of the Air Force helicopter crash," President Juan Manuel Santos of Colombia said in a message posted on his official twitter account. "Our condolences to the families of the patriotic heroes who died in this accident." In an amateur video broadcast on the local Caracol TV, dozens of people were shown standing near the crash site, which was covered with smoke and flames. The acting inspector general of the Department of Homeland Security has announced he will launch a separate investigation into the Secret Service prostitution scandal. The "field work is beginning immediately," acting Inspector General Charles Edwards said in a statement Monday. "We have maintained close contact with the USSS (United States Secret Service), coordinating with them as their internal investigation continued. Last week, with the initial stages of the USSS internal investigation nearing completion, we notified the USSS of our intent to conduct a comprehensive review of this matter," his statement said. "As we notified the USSS last week, OIG's (Office of Inspector General) field work is beginning immediately." The development comes as Secret Service Director Mark Sullivan faces a pair of deadlines Tuesday to answer dozens of questions relating to the scandal. As the Los Angeles Lakers take to the court Tuesday for Game 2 of the NBA playoffs, a key question is whether the team's forward Jordan Hill will square off against the Denver Nuggets. Authorities in Texas have charged Hill, 24, with assaulting a family member, a felony that could yield up to 10 years in prison and a $10,000 if he is convicted. Donna Hawkins, the assistant district attorney in Harris County, said Monday an arrest warrant for Hill will be issued once the magistrate has signed the paperwork - unless the player turns himself in first. After a lengthy training session Monday, Hill issued a statement apologizing to fans "for the untimeliness of these accusations." Hill, who scored 10 points and 10 rebounds in the Lakers' 103-88 win over the Nuggets on Sunday, told reporters he did not expect to miss any games. "I'll be here," he said. The charge stems from an incident on February 29 when Hill allegedly choked his girlfriend of two years at his home in Houston after the two got into an argument about their "future," authorities said. Filed under: Basketball • Sports • U.S.
A task force created by Florida Gov. Rick Scott to examine the state's "Stand Your Ground" law in the wake of the Trayvon Martin shooting meets for the first time Tuesday. Seventeen people will tackle the issue of whether the controversial law should be changed in light of the death of the unarmed teenager. The task force, whose membership was announced last month, will take testimony at public meetings across the state. The first session will be held in the state capital, Tallahassee. "We're not walking into this with any preconceived notions," Gov. Rick Scott said at an April 19 news conference. If there are "logical changes to be made," he said, the task force "will provide those." Recommendations from the group will be passed along to the governor and the Legislature. Filed under: Crime • Justice • Politics • U.S. The leader of an Amish sect in Ohio, who was indicted on federal charges for allegedly shaving the beards and cutting the hair of community members, must pay for his own legal defense after making millions off an oil-and-gas deal, court documents show. Previously ruled indigent, Samuel Mullet Sr. received about $2 million in early March by leasing the rights to his 800-acre farm in Bergholz, and will now have to foot the bill for his public defender should he choose to keep him, the judge ruled Monday. He is free to retain private counsel, should he choose to do so. The proceeds from the lease allowed Mullet to "free the farm of all outstanding debt and mortgages," court documents said. Because of his new-found wealth, Mullet must pay the public defender twice his normal government subsidized rate - $250 per hour, a court order signed by U.S. District Judge Dan Polster said. Mullet, who is the bishop of the Amish community in Bergholz, also was ordered to pay an hourly rate of $125 for legal work performed before the ruling was made.